You see them everywhere. The grocery store, the nursery, the hardware store…anywhere that they can fit a small table and their tempting merchandise. This small army is on a mission to raise funds and cause our waistlines to triple. Of course, I am talking about Girl Scout Cookies. From the way she is talking now, this may be Mimi’s last year selling these alluring treats. She’s been at it for six years now…eight if you count the two years she helped with her sister’s troop. 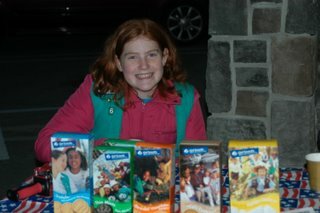 I can’t help but feel a wave of nostalgia when I think of the very first time my girls sold Girl Scout Cookies. I was one of the troop leaders so we had to bring Mimi along with us wherever we went (we all kind of thought of her as our official troop mascot) My Co-leader and I helped our group of first grade girls set up the table and neatly arrange the boxes of cookies. Then we once again coached them on good manners and how to talk to our customers. All was well…until the first potential customer walked out the door. Can you say panic? Not one of our bold and sassy little girls could utter a peep. Then our brave little girl’s face just crumpled. She burst into tears at the biggest rejection of her young life. All the other “big girls” then crowded around her in an effort to comfort her. This weekend, to our jaded merchant, a rejection is no big deal…there’s always the next customer who will buy one of each kind of box. Still, I always think carefully before I decline buying a box or two…I’d hate to break a young girl’s heart. This entry was posted in Mimi, Random stuff. Bookmark the permalink.